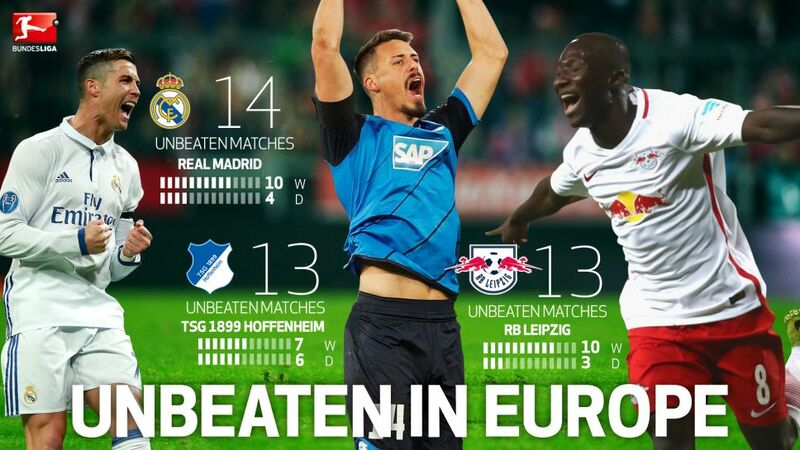 What do RB Leipzig, TSG 1899 Hoffenheim and Spanish outfit Real Madrid CF have in common? That's right, they are the only teams in Europe's top five leagues yet to taste defeat this season! Fancy adding some Leipzig sparkle into your Official Fantasy Bundesliga team? Head here to do so now! Of all the teams in the German, English, Spanish, French and Italian top flights, Bundesliga newcomers Leipzig, Julian Nagelsmann's bold Hoffenheim ensemble and the reigning European champions are the only ones still unbeaten. Surprise leaders Leipzig have shot to the top of the standings thanks to their electrifying attacking play and have scored as many goals as defending Bundesliga champions FC Bayern München this term (29). “It’s a great feeling to know that the fans are so happy and are shouting ‘We are top of the league!’ after the game,” said Leipzig captain Willi Orban following his side's Matchday 13 victory over FC Schalke 04. The defender refused to be drawn as to whether the eastern German outfit could stay unbeaten before the winter break, but is aware he and his team-mates face a tough task to do so, with fixtures against FC Ingolstadt 04, Hertha Berlin and Bayern still to come.